This two layers multi-function jewelry box with Mirror will help you to keep your jewelry and small things in good order and protect your beloved jewelries. A mirror in the top section makes it convenient to see the accessories you are trying on. The lid opens up to reveal six small compartments ideal for holding earrings or rings. It is a great gift for any women and girls. 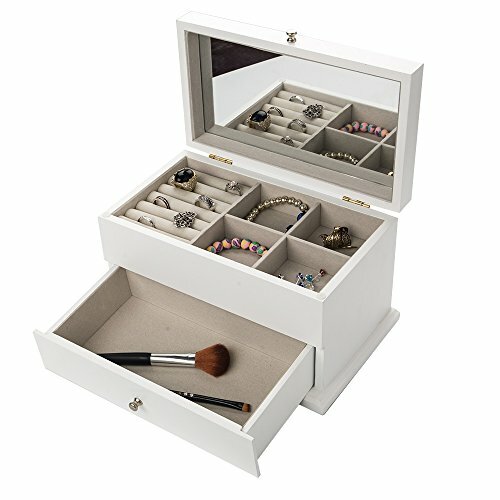 This jewelry storage organizer comes with a white finish. -Product Dimensions: W 11'' X D 6.4'' X H 5.9"
If you have any questions about this product by INART, contact us by completing and submitting the form below. If you are looking for a specif part number, please include it with your message.